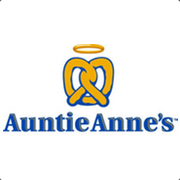 Auntie Anne’s provides 11 varieties of hot, fresh pretzel products, in sweet and zesty flavors. And nothing goes better with your pretzel than one of our dips and our Old Fashioned Lemonade! Auntie Anne's is hiring a Part-Time Crew Position with 15-20 Hours per week. Applicant should apply in the store. Contact person is either the manager, Robin, or the Shift Manager.